There, was that really so hard? Two words that have taken 11 days to say: I’m sorry. disappointment get to him when given out. But he, and those around him, must have known straight away his actions were not acceptable. Instead of talking about Janeiro Tucker’s record run haul, one man’s poor behaviour has dominated the aftermath of the island’s biggest sporting event of the year. That it’s seemingly taken a suspension from the BCB training squad to get Gibbons to publicly recognise this, does not reflect well. An immediate apology would have gone a long way to rectifying matters. But whatever punishment comes his way, Gibbons must now focus on using his undoubted passion positively. He can yet be a Cup Match hero. 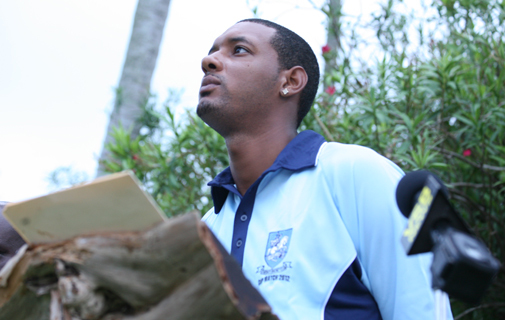 St George’s batsman Treadwell Gibbons today apologised for his behavior on the second day of Cup Match. The 28-year-old refused to leave the crease after being dismissed and then marched towards the Somerset players waving his bat. But today Gibbons insisted he never had any intention to ‘hurt or hit’ anyone during the outburst. And he said he still hoped to play for the national side as well as in Cup Match in the future, despite being dropped from the BCB’s senior national training squad for the ICC World Twenty20 last week. Speaking from written notes he said: “First of all I want to apologise to the Governor, the Premier, St George’s fans, Somerset fans and the people of Bermuda. He told the press conference at Barr’s Bay Park: “It will not happen again. “I am taking steps to work on self-discipline to prevent such behavior from reoccurring. “It was never an intention of mind to hurt anyone or hit anyone. Gibbons is yet to find out what his punishment for the outburst will be, and St George’s Cricket Club have remained tight-lipped on what sanctions they will impose on their player. But the all-rounder said he had apologised in person to the club and would accept his punishment. He added: “At Cup Match I really, really wanted the best. “I had goals that I wanted to accomplish and I am deeply sorry I did not achieve them. “I have been playing cricket all my life, for over 20 years, ever since I was five years old. “The person who inspired me was my daddy, he took me to games and played cricket with me. The game is in me, in my blood. I love to play. “I love to represent the Cleveland County Cricket Club and have the opportunity to represent my country. PHOTOS: Cup Match is not just about the Match!